(BPT) – From tools and stools to trunks and junk, it seems the garage is home to just about everything these days — except the car. As summer gear is put away and preparations for winter months begin, fall is the perfect time to organize the garage, reinforce garage safety and move the car back inside. Sort through and throw out rusty tools, broken toys, worn-out sports gear and other items you haven’t used in the last year and recycle, donate or sell usable items. 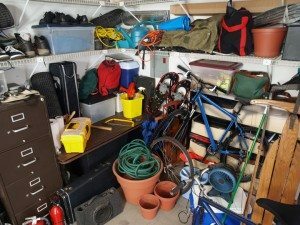 Then, group remaining items into categories, such as holiday decorations, gardening tools and sports equipment to begin the organizing process. Divide the area into zones, making sure to designate a parking spot for the car. Allow enough space for vehicle doors to fully open and for individuals to walk around without bumping the car. Sweep this area to avoid tracking dirt and debris into your car or home. Store small items in a clean, dry place for maximum organization. For flexible storage — and to transport tools easily — the Crawford Safe-Mount Mobile Caddy features a bin with mesh pockets to store everything from weed picks to gloves, and a wall mount bracket to keep tools off the garage floor. When zoning your garage, don’t forget the walls and ceiling. 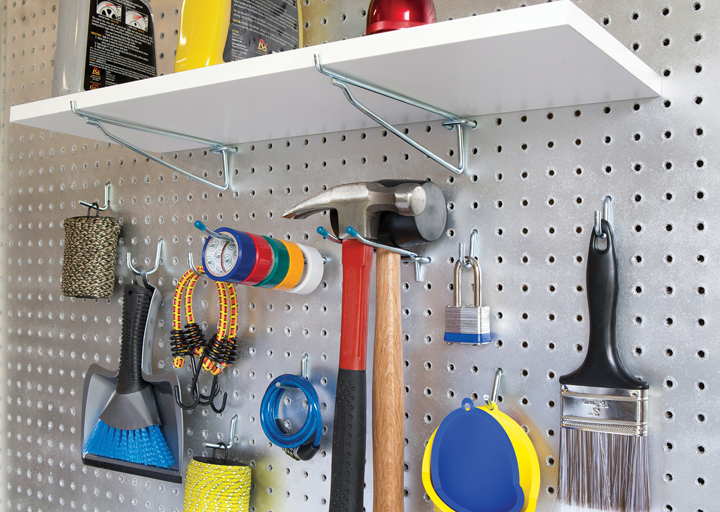 Install hanging shelves, pegboards, storing rails and overhead storage systems to open up floor space and enjoy a more organized system to visualize your tools. 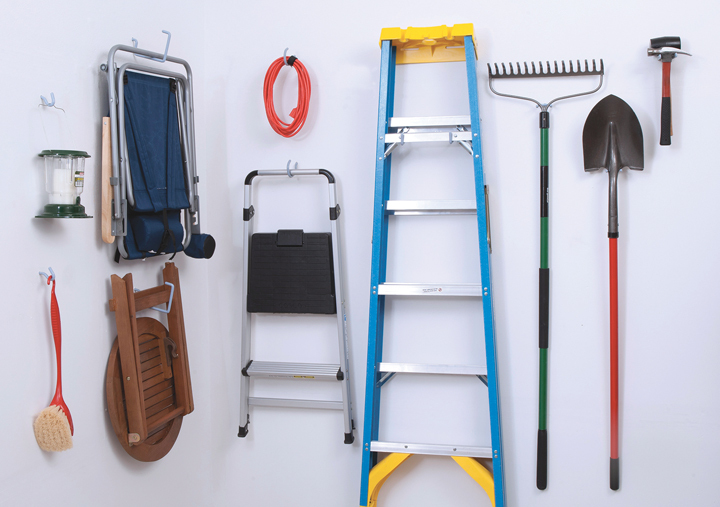 Keep a sturdy step stool or ladder handy to safely reach overhead equipment. 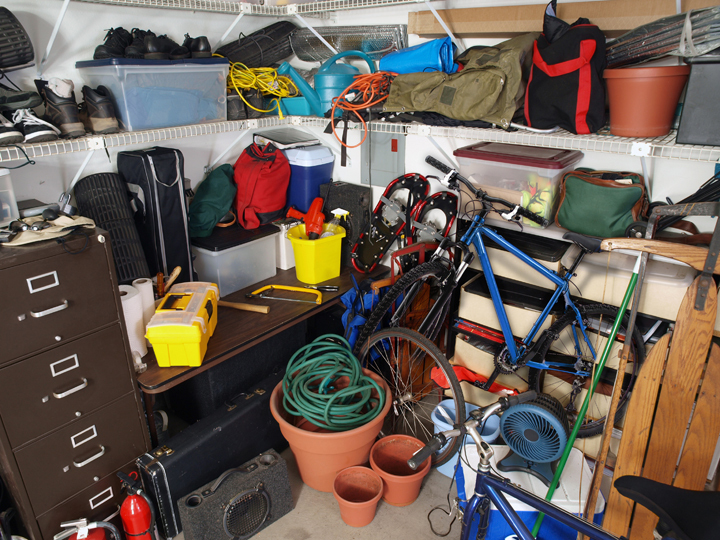 With 70 percent of Americans using the garage to store equipment, such as saws and power tools, it’s important to ensure these large and potentially dangerous items are properly anchored. Always remember to follow all manufacturer instructions regarding weight limits when using wall hooks, rails and shelving.